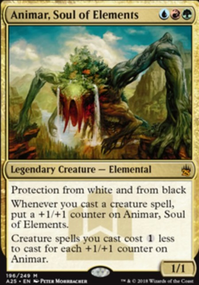 Can I play an Aura like Alpha Authority on a planeswalker to give him hexproof? If not what ways are there to protect them from removal and such? -7: You get an emblem with "Creatures you control have double strike, trample, hexproof and haste." I have to agree with that - planeswalkers are difficult to parse, especially for newer players, and the problem is exacerbated when multiples are played. additionally, you can realistically play only 3 out of 6 walkers in your pack, since the other will not fit your colors. And you cannot expect to draw more than 2 of those in the average game. finally, most walkers really have 2 abilities - a plus and a minus ability and an ultimate, which the opponent does not care what it does, just how much loyalty it takes to activate and stopping it. 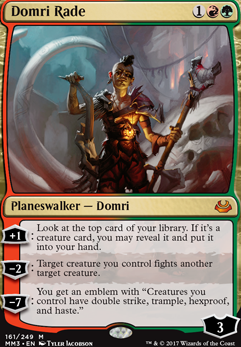 Domri Rade : +1 is not very good? Draws you around 1/3 of a card every turn. I'm assuming you're playing him for his ult, which is kind of a bad idea. No player in their right mind is gonna let that boi get his ultimate out, and with four people at the table? Not likely. Sachi, Daughter of Seshiro : the most expensive card in your deck is Woodfall Primus at 8 mana (yes, I know Blasphemous Act is 9 technically but realistically it's 1). 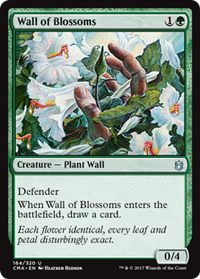 What do you need with all this mana after turn 4? Casting your whole hand every turn? You don't have the draw to sustain that. Love Prophetic Flamespeaker in a voltron deck but here it's kinda shaky. Theater of Horrors seems much better. triproberts12 So what do you think of this? 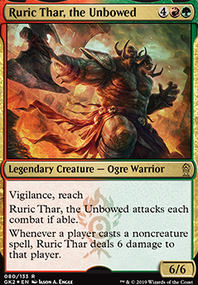 Cut Domri Rade , Huatli, Warrior Poet and Thundering Spineback for Sheltered Thicket , Sunforger and Crush Contraband ? triproberts12 Hey Bud. Yeah, all the cards in the main board I own, and most in the Maybeboard. Just read the article and that was really interesting. Guess I should probably run Sakura-Tribe Elder over Explosive Vegetation ! 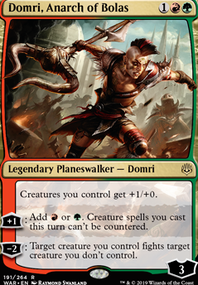 Would you say that Territorial Allosaurus should be ran over Domri Rade then? As it can be hit off of Gishath, Sun's Avatar ? I just find that he comes down, makes something fight and then dies, and even if he survives he then has a 30% chance of drawing you a card. 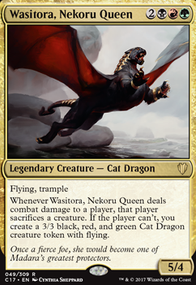 I agree with you on Huatli, Warrior Poet , and I think that does probably mean that Charging Monstrosaur is better, but I'd still put in things like Sunforger above it. I still don't even think that Vanquisher's Banner is that good in this deck, and adding something like Crush Contraband a long with Sunforger would be a better include. Scattered Groves and Sheltered Thicket should probably be in the lad base anyway. I don't know about going all the way up to 40 lands as that's how many I have in my Omnath, Locus of Rage deck! 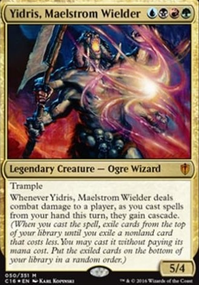 Average on EDHREC is now at 38, so I should go up one or maybe even two. It has occurred to me that there is a sweet combo with one of the indestructible spells like Make a Stand and a combination of Raptor Hatchling or Forerunner of the Empire + Polyraptor . In combination with Impact Tremors or Purphoros, God of the Forge this would make a quick win. Would you say that this is worth going for and building in? Or am I convoluting the strategy! Once again if there's anything I can do on your tappedout let me know and I would be happy to oblige.